I picked up a hardware store plain galvanized bucket to use as a patio table centerpiece "vase." I stenciled "Faith Hope Peace Love Joy" in white using craft DecoArt metal paint - an indoor/outdoor paint. I've had many buckets that are actually not sealed good and leak water, so check yours first - you may need to add a liner. Here's the whole tablescape at our old house. We had amazing climbing roses that had been planted decades before me and they bloomed for months every summer! Made for a lovely garden gatherings despite my two black thumbs! If you'd like to see loads of gorgeous tablescapes from other bloggers, please visit Tablescape Thursday at Between Naps on the Porch. If you'd like to see loads of fun DIY ideas, please visit Kimba at A Soft Place to Land. Happy Summer!! Pretty! I love peonies... and always love the combination of pink and green! I love the green and pink together...two of my favorite colors I like to use. Very Pretty! I love peonies and finally got around to planting some this year. Love the bucket idea, very cute! We Bloomgirls are very much "into" inspirational decor! Have a fabulous week! What a beautiful tablescape, Jeanne. Peonies are so beautiful. I love Peonies! In AZ they pretty much unheard of! Pretty table! Peonies are my FAVORITE!!! This is gorgeous! I love the bucket! I think I would love one with our last name on it. The bucket is darling and the peonies perfection!!! 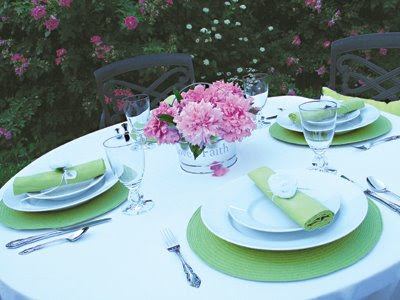 Your tablescape is so pretty with the pink and green...I love it!!! This is one of my faves in your book, as well. Peonies are my absolute favorite flower!! And the bucket is too cute. Oh, so adorable, and such pretty colors! I love pink and green. I will have those colors next week! Happy Thursday! Don't those galvanized buckets come in handy? I love the stenciling on yours. My mother grew peonies and I wish I had some-loved seeing yours--beautiful! It did come out cute! I love it! Peonies are some of my favorites! I love it. this is so sweet. thanks for the post. great blog! A stenciled bucket! Now that is really pretty! Have to put my thinking cap on and figure out how to do this myself! Green and white is my favorite combo and the pink peonies make it awesome! Is there more like this in your book? Hmmm, will that work on metal - I'm not sure...if not, try a band of paint on which you do the words. I used to grow peonies like those in Colorado but then we moved to Arizona and the don't grow here... I think they need a hard freeze to blood... I miss them... Yours are perfectly pink and pretty. I love this! I have searched all over for galvanized buckets and haven't found exactly what I what. Thanks for your creativity. I will be watching for you in Halllmark. I love it! And the table is lovely! Just wanted to say hi and say I am sorry it took me so long to come over... thank you for visiting my blog a couple of weeks ago! Beautiful! I love peonies too. I recently came across your blog and have been reading along. I thought I would leave my first comment. I don't know what to say except that I have enjoyed reading. Nice Home Decors. Please visit my wall mounted fountain blogs. Thanks! I love that, so pretty and elegant with an inspirational message! This is just beautiful. I love peonies too. And hydrangeas. And Snowballs. Ok, I love puffy flowers! OOOOOH how beautiful!!! 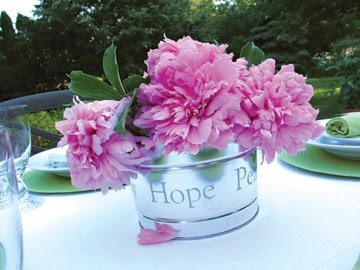 Love that idea or the buckets, andthe peonies are gorgeous too. Great tablescape. It is rather interesting for me to read the article. Thanks for it. I like such topics and anything connected to this matter. I would like to read more on that blog soon. Rather interesting site you've got here. Thanks for it. I like such themes and anything that is connected to this matter. I would like to read more soon. It was certainly interesting for me to read the post. Thanx for it. I like such topics and everything connected to them. I would like to read a bit more on that blog soon. Hey, I have been looking for a good wedding centerpiece and I think the stencil bucket is adorable.. very cute... what are the dimensions of the bucket? Which hardware store did you get them at? Rather interesting blog you've got here. Thanks the author for it. I like such themes and everything that is connected to them. I definitely want to read a bit more on that blog soon. Hi April! The bucket top opening is about 9" across. I think they were from Home Depot or Ace. Thanks!